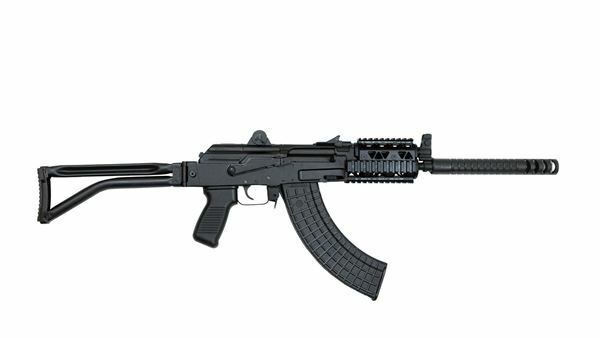 The SAM7SFK-80R rifle is a semi-auto version of the Bulgarian model AR-M4SF with the NEW Arsenal Gambit attached which extends the barrel and enhances the firearm and includes PR-03 Rail. You are going to love the authenticity of this firearm - from the right side folding tubular buttstock to the vertical front sight/gas block combination, you have truly purchased a unique Bulgarian beauty. With only limited quantities, this is a collector's dream! The SAM7SFK-80R allows you to take home the Arsenal Krink you've always wanted without the need for a Tax Stamp! Each SAM7SFK-80R receiver is milled from a hot-die hammer forged receiver blank by the Arsenal Co. of Bulgaria. Arsenal's hammer forging produces stronger and finer-grained steel. Internal voids and cooling deformations are eliminated by the 5-ton hammer forging process. SAM7SFK-80R, 7.62x39 caliber, milled receiver, short gas system, chrome lined hammer forged 8.5” barrel with ALL NEW barrel extending Gambit, PR-03 rail system, front sight/gas block combination with 24x1.5mm right-hand muzzle threads, right-side folding tubular buttstock, black polymer pistol grip, ambidextrous safety, peep rear sight, and PR-03 rail system. Comes with one 30-round magazine, sling, oil bottle, and cleaning kit.